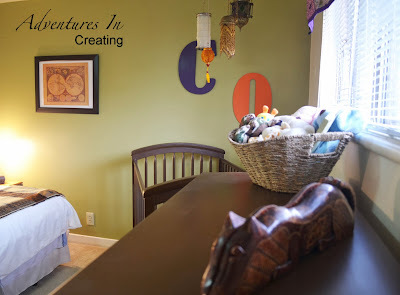 Adventures In Creating: Twin Nursery Reveal!! Hello All! 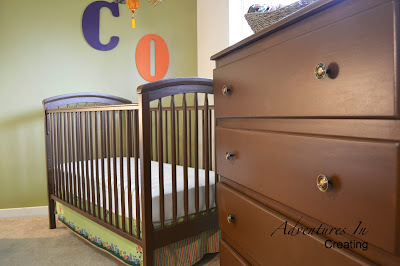 Today I am super excited to share with you the finished Twin Nursery!!! 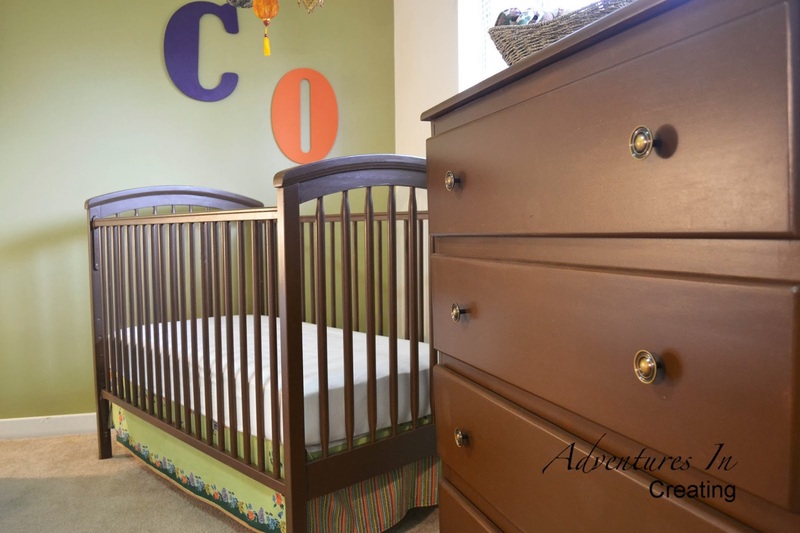 The twins aren't officially due until the end of December but with Mom put on bed rest a few weeks ago it was time to put this redesign into high gear. (Nothing like the prescription of bed rest to put a fire under your behind.) Babies don't wait for anyone! 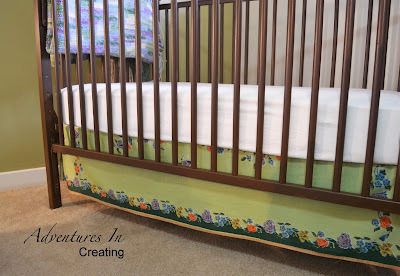 For those just joining us this is a nursery design done for a friend. She is pregnant with boy/ girl twins, has 2 boys under the age of 4 and her husband is deployed right now. Can anyone say Super Mom??? 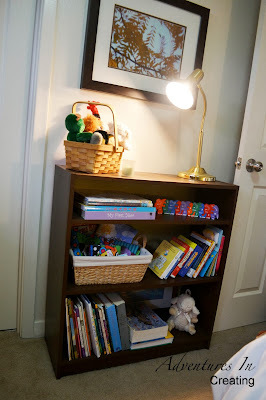 My friend had an idea of what she wanted the nursery to look like and had most of the accessories we were going incorporate into the room; she just needed help bringing it all together. She has lived in some exotic places and wanted the nursery to have a International or Traveled feel. The room also had to be gender neutral. The challenge was reusing their existing furniture, working with the fact that this is still going to be a guest room as well as nursery, and that they live in base housing- so walls we painted they will have to repaint and the family may move into a larger home in the near future. And some after shots. 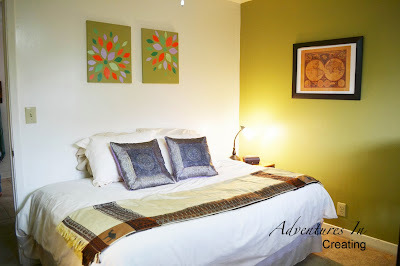 We painted one accent wall to help warm the space up. 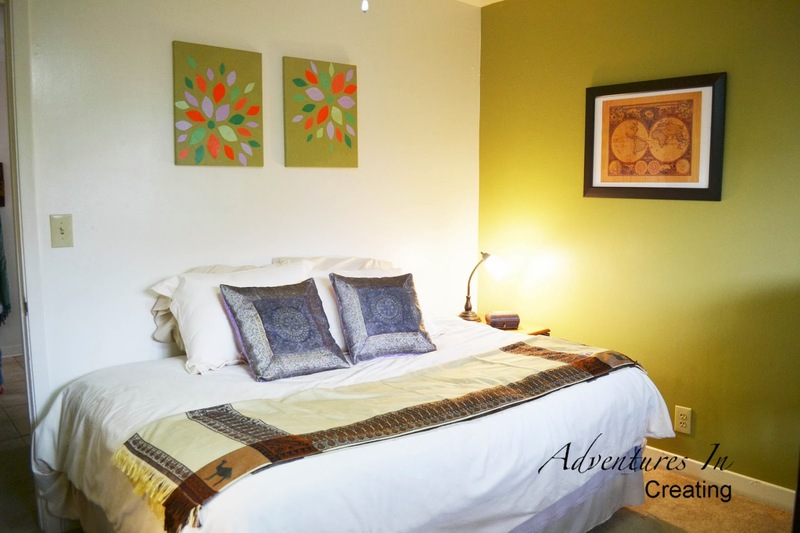 The curtain is a Batik fabric we hung from clips. We painted her existing crib, dresser, and bookcase. 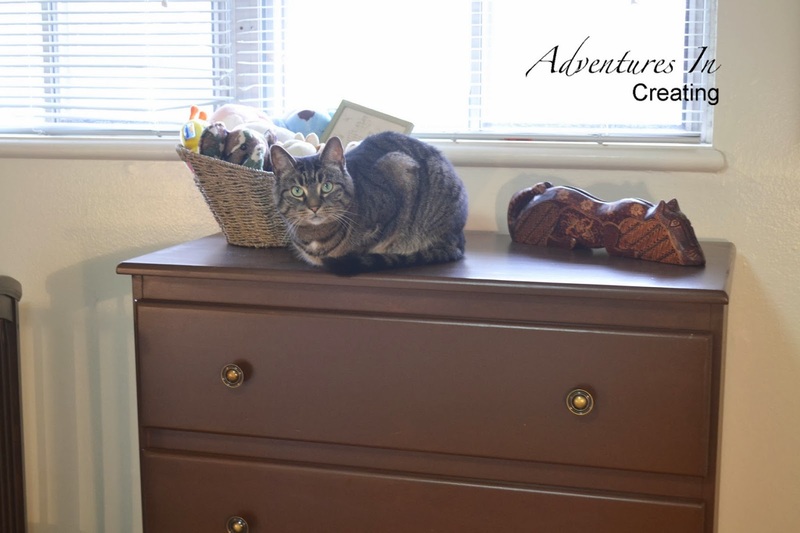 We added new knobs to the dresser. One of her friends who is an amazing seamstress made the crib skirt from a Batik fabric. 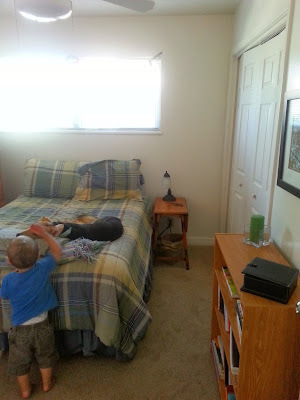 This was the jumping off point for the color scheme of the room. 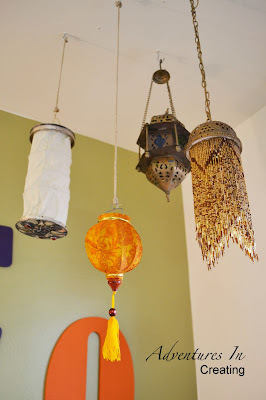 My friends lanterns are now a mobile for the babies to look at while chillin in their crib. 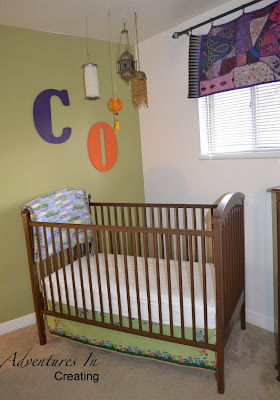 Babies Initials above the crib and a splash of color. Artwork created by the Mom To Be! And that's the tour. 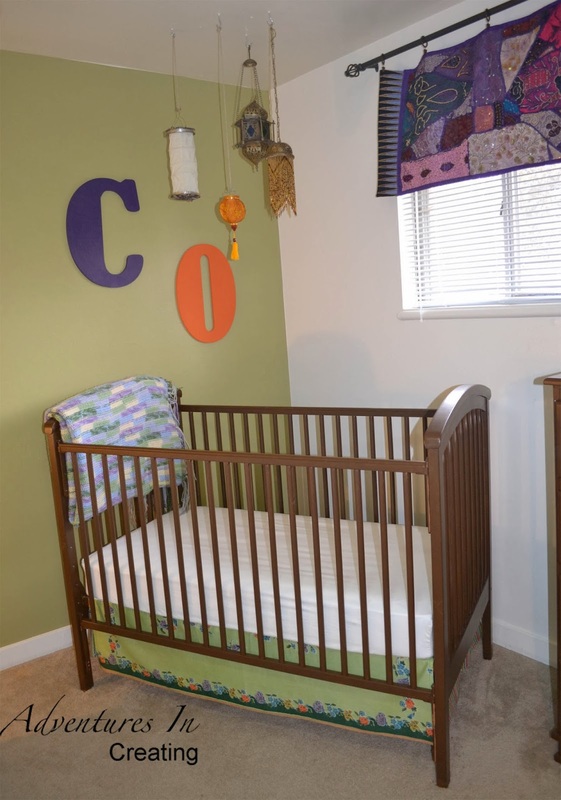 The only money spent was for paint, the wooden letters, and a new bedspread. Everything else my friend already had. This room was a fun adventure and challenge. Looks great! 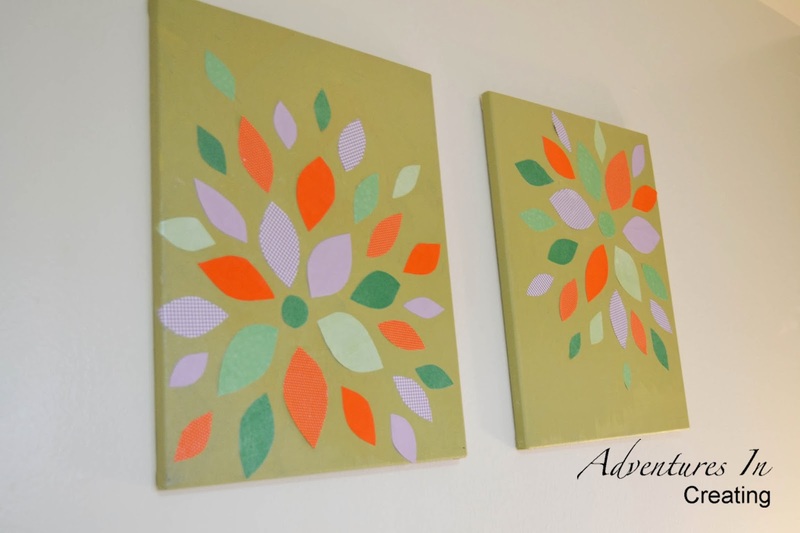 Love the artwork you made! love the lighting as mobile, great idea, and good luck to her! yeesh! She really is a super Mom!!! 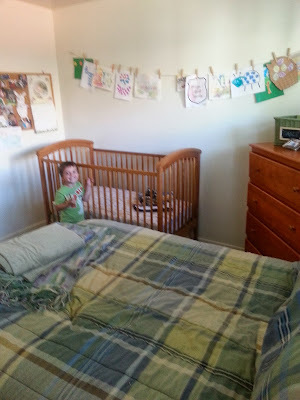 What a great job on the nursery. It looks fantastic. 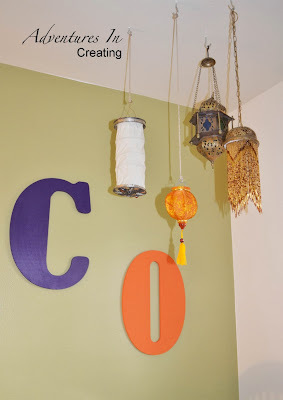 I love the lanterns above the crib. A great spin on a mobile. Love the fun lights/mobile! What a fun way to add some exotic feel to the space!